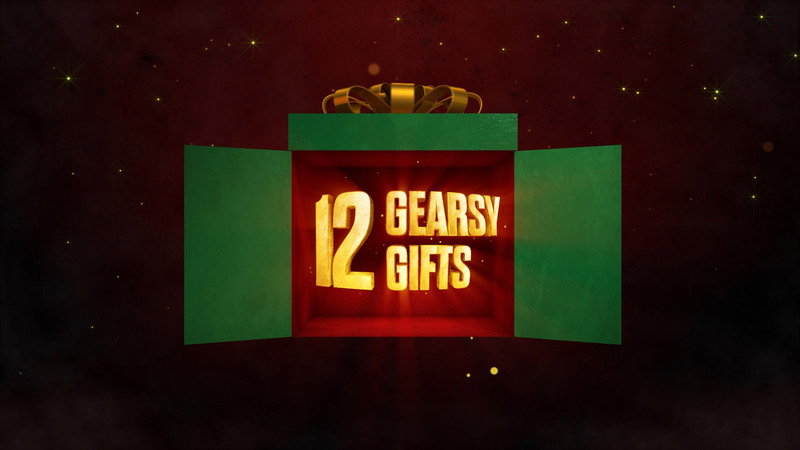 Tis the season to be gibbing, and we're getting in the festive mood with the biggest Gearsmas event in Gears history beginning on December 15th through to January 2nd! Check out the trailer above for your first look at the events and skins to earn this Gearsmas, then read on for full information including weapon skin challenges and more. 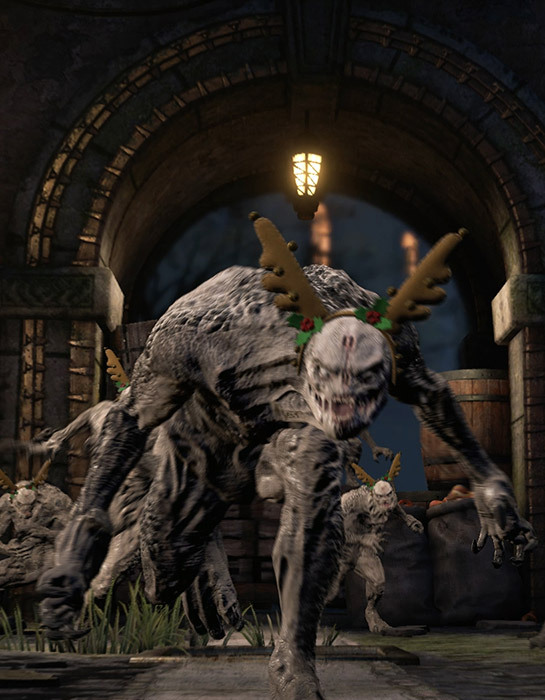 If the name didn't give it away, hordes of antler-topped Juvies will be coming for you and your squad in this 25 Wave Horde Variant. Outside of boss waves, you'll have to fend off masses of Juvies supported by Trackers as they hammer your defences. Barriers won't help you much here as they can be destroyed in one hit, and all fortifications have vastly reduced health, so place those Decoys and Sentries wisely! On the boss waves, we also add a random set of tougher enemies to the mix that add to the insanity - be prepared to duck and dodge everything from Dropshot Scions to waves of Guardians. Jingle Juvies will be available on Normal and Insane difficulty beginning December 15th. These stats are tracked in our backend and not visible to players. We recommend manually tracking as you play if you want to ensure you your Weapon Skin. To qualify, you must be connected to Xbox Live and complete these objectives in the Jingle Juvie playlist by no later than January 2nd at 10am PDT. Rewards will be granted to qualifying participants by end of January. Snowball Fight is back for Gearsmas 2017! 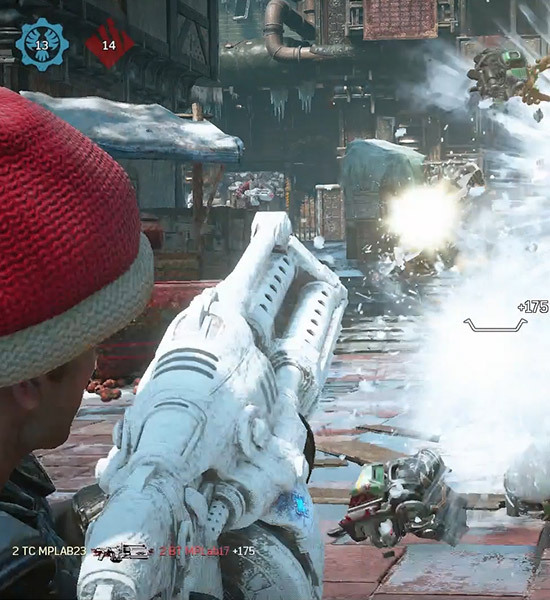 For those of you who don't know, Snowball Fight is a special variant of TDM that arms you with the special Holiday 'Snowshot' (a Boomshot that fires snowballs to put it simply!). This year, we've removed the splash damage almost entirely - so now you'll have to hit your opponent directly from the knees up to get a kill. The action is fast and frantic, but you have plenty of ammunition in this all-out-fun game mode. Find Snowball Fight under Versus -> Play Special Events from December 15th until January 2nd. These stats are tracked in our backend and not visible to players. We recommend manually tracking as you play if you want to ensure you your Weapon Skin. To qualify, you must be connected to Xbox Live and complete these objectives in the Snowball Fight playlist by no later than January 2nd at 10am PDT. Rewards will be granted to qualifying participants by end of January. Get in the Gearmas spirit with this year's exclusive Holiday gear pack! 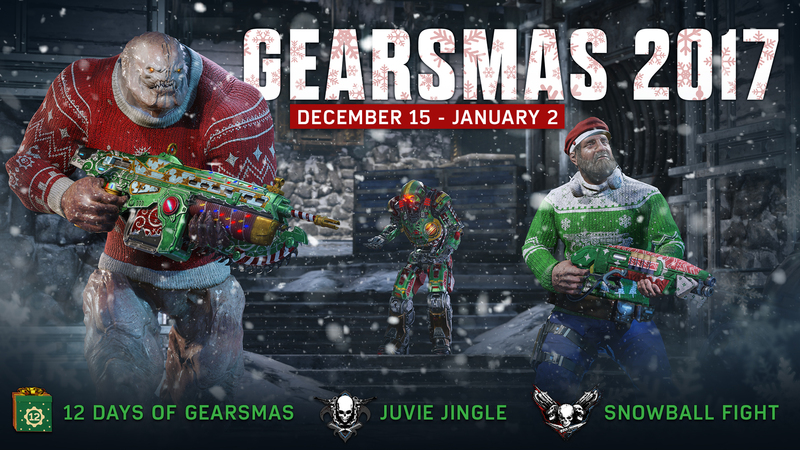 This year we're going for the Gearsmas Sweater theme with our Imago (yes, just wearing a Sweater) and Dizzy. 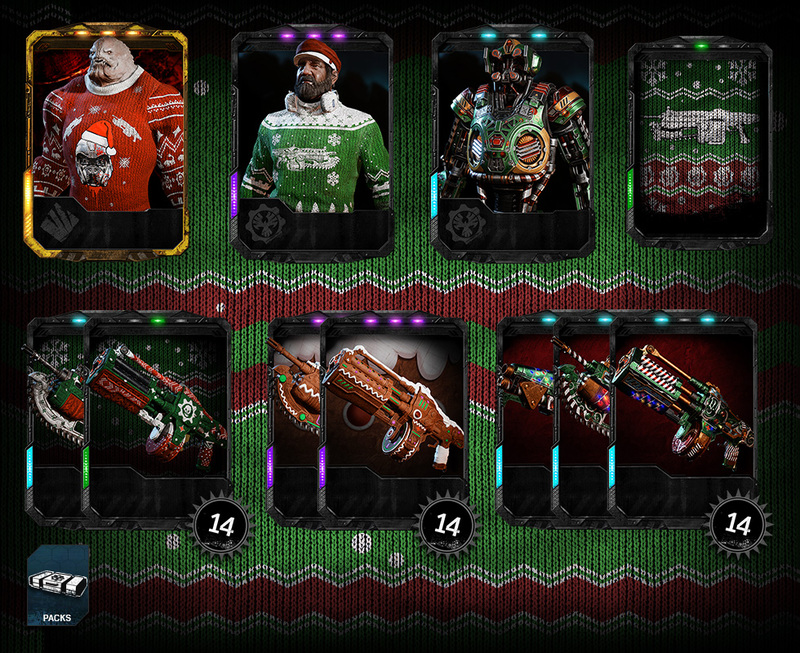 There's also a bonus Festive Tree DR-1 to collect along with animated Gearsmas Light skins and Knitted Sweater Skins. For those collectors out there, we couldn't resist completing the loved Gingerbread set for this year too! This Pack is available for 400 Credits from December 15th until January 2nd. Don't forget that every day until the 21st December, we have a special bonus or gift for fans playing! So far we've had 2-3x XP days, Gearsmas 2016 character giveaways and bonus First Win of the Day Credit events (speaking of which, we left a little hint of Credit events to come in the trailer). Stay tuned to our Message of the Day, Twitter or Facebook to find out the day's bonus!